On October 29, 2013, I went to the University of California, Los Angeles, for a guest signing and panel event that featured Nobuo Uematsu and his band The Earthbound Papas, courtesy of Babel Entertainment. The UCLA Japanese Animation Club hosted the event, and the UCLA Video Game Orchestra and Choir performed for the guests of honor. Before the event, I was able to catch an interview with the legendary composer responsible for many cherished Final Fantasy games, as well as Lost Odyssey, The Last Story, and many others. I was guided to a small classroom, where Mr. Uematsu sat next to his translator. The atmosphere in the room felt very calm and inviting. After some small greetings and introductions, I asked Mr. Uematsu some questions regarding the naming of his recent band and what his plans were for music and video games performing with The Earthbound Papas. Questions ranged from curiosities, such as his favorite game from among his body of work and which band members grew up playing his games as children, to what plans he has for recording video game music in the future. During our conversation, Mr. Uematsu asked me a question himself, which I gave a flattering but nonetheless honest response to. Overall, it was a very relaxed interview session with some friendly chatter. You can watch the full interview below. Captions are provided in case the audio is indiscernible. It was an exciting moment to meet the man responsible for countless pieces of music that made many of our favorite Final Fantasy games, among many others, so memorable. 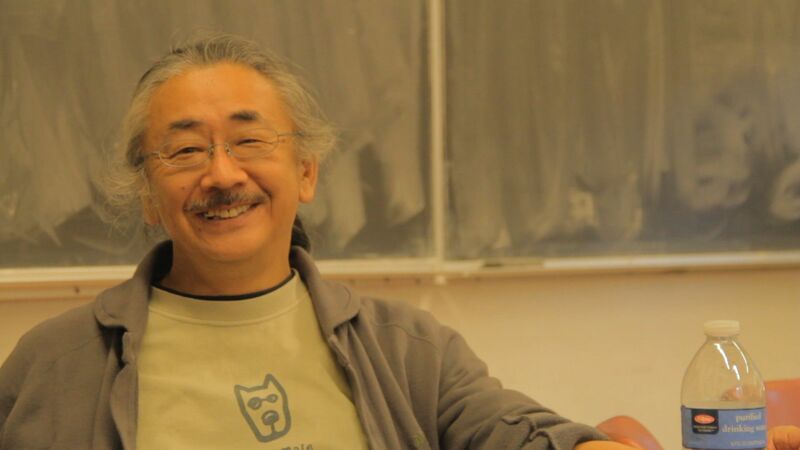 I hope you’ll enjoy the video interview with Mr. Uematsu. Please be sure to check out more of our video content on YouTube—we plan to deliver more exciting videos in the future. Also, be sure to visit Babel Entertainment for any news on live shows featuring The Earthbound Papas, as well as other musicians who may be playing soon near you. Special thanks to our Quality Control Manager, Oscar Tong, for his continuous support, critiques, and his recommending me to write this article, and to our YouTube Manager, Chris Stollings, for helping me upload the video, plus continuously adding content to the oprainfall YouTube page. Additional thanks goes to Masha Lepire from the Video Game Orchestra Choir, Meagan Yip from the UCLA Japanese Animation Club, and Babel Entertainment for making all this possible. UPDATE: I especially want to thank Ricky Rowland for his liaison work to bring Babel Entertainment staff and the respective press members together. I sincerely apologize for not recognizing him sooner.